This last day of Holidailies and first day of 2013 found me waking in my bed at home for the first time since December 21st. Mr. Karen and I road tripped out to Idaho to our ski condo, making stops in Illinois on the way to see family. We flew back late last night. Today I’ve been dosing myself with various remedies to try and fight off the germs I think I picked up on the planes we were on, which featured plenty of coughing people. 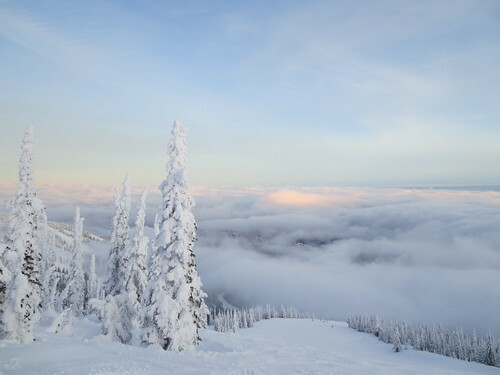 At some point, I’ll do a real trip report, but for now I’ll simply share one of my favorite pictures from the week, taken on Schweitzer Mountain one of the days we got to ski above the clouds at our home away from home. What a beautiful shot! Happy New Year to you and Mr. Karen.